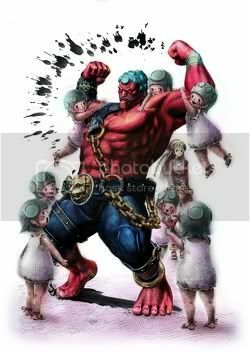 I know the world already knows Hakan is the tenth and final fighter to be added to Super Street Fighter IV. But I can't resist posting his videos. He seems like a very interesting character and I feel that he plays a lot like Zangief. But I guess you just have to see all the videos after the break. But first here's a few clips about him. Hakan is the president of the world's leading edible oil manufacturer and a leader in Turkey's national sport of Yağlı güreş. His drive to fight in the Street Fighter tournament is not fueled by revenge or honor, but rather to have fun and make his cherished wife and seven "pretty" daughters proud, along the way searching for the world's perfect oil recipe.